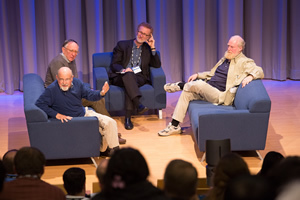 Carl Steinitz (left), Jack Dangermond, Thomas Fisher, and Bran Ferren kick off the Geodesign Summit with a conversation about the merits and drawbacks of a 250-year design plan. Urban planners in the United Kingdom and Iraq are using geodesign technologies to create a master plan for the city of Nasiriyah, Iraq. Planners in Honolulu, Hawaii, used geodesign to visualize and analyze the impacts of different design scenarios for the Honolulu Rail Transit project. Philadelphia University (PhilaU) will offer a master's degree in geodesign starting this fall. 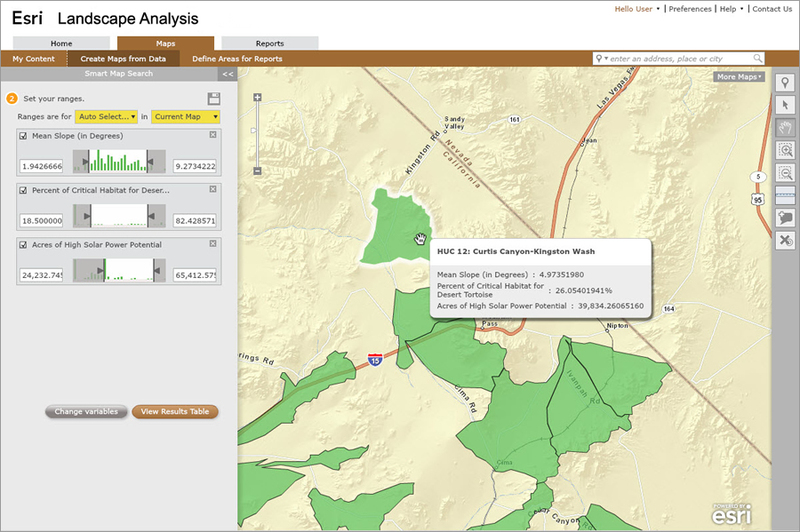 Esri demonstrated new landscape analysis data services (currently in beta) specifically geared to geodesign work. Geodesign couples geography with design. Practitioners use both their creative design techniques and geospatial technologies, such as geographic information systems (GIS), to iterate and come up with design options to consider and eventually arrive at smart, sustainable solutions. "It makes design decisions data rich," said Thomas Fisher, the summit's moderator and a professor of architecture and dean of the College of Design at the University of Minnesota. "It takes GIS analysis into the future to [show] not only what is but what could be." Elliot Hartley talks about using Esri CityEngine to save time creating 3D visualizations of urban areas in Iraq. Claudia Goetz Phillips, director of Landscape Architecture + GeoDesign at Philadelphia University, said geodesign has moved from the conceptual state where it was four years ago to something concrete. She was a driving force behind creating a new master's degree program in geodesign at her university. "It is very exciting to be at the forefront of this exciting and relevant paradigm shift in how we address twenty-first-century global to local design and planning issues." Breece Robertson, national GIS director for the Trust for Public Land, sees geodesign as a collaborative process that involves many stakeholders. "The words iterative, futuristic, and impacts come to mind as but a few of the key components that are involved in the geodesign process," she said. "I think a lot of us have been doing geodesign for a long time, but there is always room for improving our processes." Many of the presentations demonstrated the maturing technologies that will support geodesign in the future and the type of projects that would benefit from that design approach. One of the featured speakers was David B. Bartlett, vice president of IBM Smarter Buildings. Known as IBM's "Building Whisperer," Bartlett's job is to work to make places like school districts and universities more energy efficient. At the summit, he talked about the role data and location-based analysis play in achieving this goal. (IBM partnered with Esri and CitySourced to create a crowdsourcing application for smartphones that students, teachers, and staff at the Los Angeles Unified School District can use to snap photographs of and record the location of broken windows and faulty air conditioners at schools. Quickly fixing these problems saves money and energy.) "They became green reporters for the schools," Bartlett said. A 3D city model of Honolulu constructed from footprints and some sparse 3D models in Esri CityEngine. Elliot Hartley, a director of Garsdale Design Limited in Cumbria, United Kingdom, gave a talk called The Instant City—Geodesign and Urban Planning. His firm, along with its Iraqi Planners Group, is creating a master plan for the city of Nasiriyah, Iraq, which includes plans for future housing, utilities, and infrastructure. 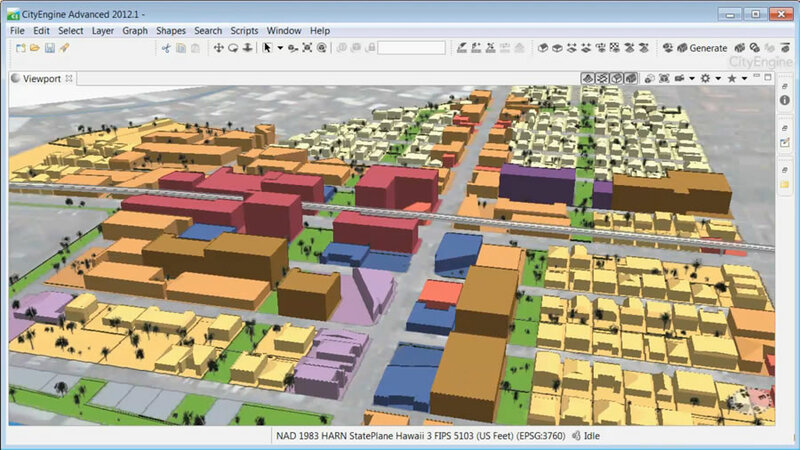 Garsdale used the capabilities in Esri CityEngine, 3D modeling software for urban environments, to change the plans when new data was added or late changes were made to the project. Work that took four days using other software took only a half day using CityEngine, he said. 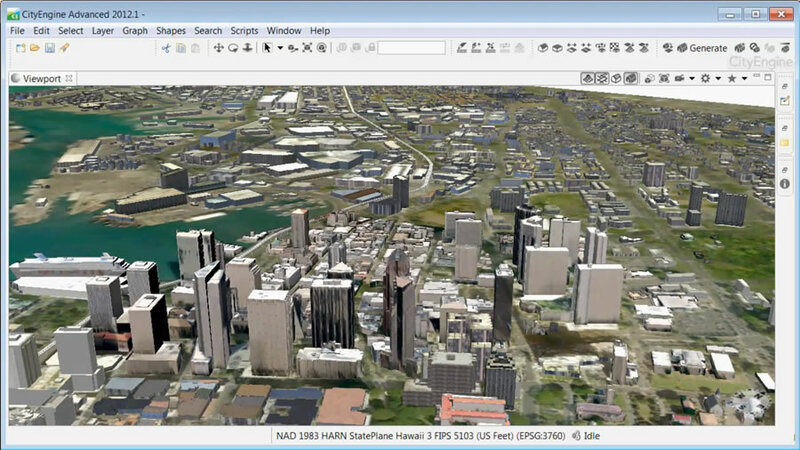 A geodesign-related technology demonstration showed how Esri technology, including CityEngine, was used to model the impacts of transit-oriented development in 3D for the city of Honolulu, Hawaii. With traffic in Honolulu often called a nightmare and an expected population increase of 250,000 by 2050, the city faces major development decisions. A potential area of densification around a light rail stop, rendered from a 2D zoning change map created in ArcGIS. Esri solutions engineer Eric Wittner showed how Esri software was used to model alternative futures for Honolulu. First, GIS information prepared using Esri ArcGIS for Desktop and 3D GIS data from Pictometry and PLW Modelworks that represented realistic building models for portions of the city were combined in Esri CityEngine. Using a set of rules, a 3D representation of the city as it looks now was generated in CityEngine. Then the software was used to model different scenarios of how the city might grow. Using geodesign to fight urban sprawl and tackle climate change and other significant issues was a major topic of conversation at the Geodesign Summit. Esri president Jack Dangermond told summit attendees about his enduring belief in technology as an agent of positive change to tackle the planet's big problems. "In my life, I always believed technology could matter," he said. 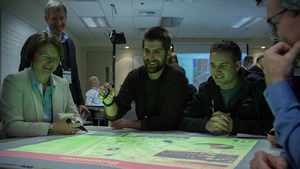 The audience enjoyed the technology demonstrations at the Geodesign Summit. He also spoke about geographic information systems becoming a platform technology that's more participatory than ever before because it's now widely available via a cloud gateway that supports applications on the web and on mobile devices. "This potentially has the power of making the concepts of geography, the models, the analytics—not simply the visualization—available to everyone," Dangermond said. For organizations, this means that geographic knowledge—including geodesign tools—will become available to a much wider audience than in the past. 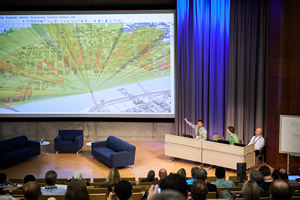 This idea of GIS as a platform was brought home to the audience with demonstrations that showed the increasing simplicity of making online maps using ArcGIS Online and Esri Story Maps templates. Esri staff also gave short demonstrations of Community Analyst, which is used for mapping demographic, health, and other data. Esri technology evangelist Bern Szukalski gave the audience a sneak preview of Esri's landscape analysis services (currently in beta testing), geared specifically toward geodesign work. He used these services to study the siting of the Ivanpah Solar Electric Generating System currently being built in the Mojave Desert. His demonstration put the services to work studying the solar generating potential at the site, the slope of the terrain, and critical habitat areas for desert tortoises in proximity to the location of the solar project. Landscape analysis services are highly suited toward being used to study various scenarios for regional planning projects, Szukalski said. Esri landscape analysis services can provide environmental analyses and reports. 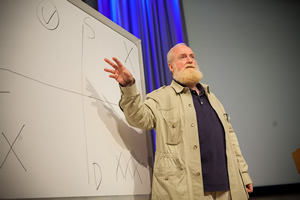 The Geodesign Summit's keynote speaker was designer and technologist Bran Ferren, who was also the keynote during the first summit. He returned to deliver a challenge: Develop a 250-year plan for the planet enabled by geodesign to create a vision of the future. "Geodesign combines geography and data with modeling, simulation, and visualization to tell stories and [show] the consequences of your actions," Ferren said. He sees great potential for geodesign to ultimately help find solutions to complex problems. "It is still in the shiny object stage, but it will be very important," he said. 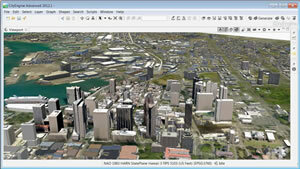 Geodesign technology will mature naturally, much like other technologies, such as GPS, did. But meanwhile, says Ferren, in this era of short attention spans, people need to start thinking far, far into the future to create a problem-solving template that can be built on over time. "If we are going to address these big global issues facing us—whether that's disease, education, freshwater, war, or global warming—you actually have to take a long view," Ferren said. "For this planet, we need—pick a number—a 250-year plan." "I argue that just having the discipline to sit down for a day and think about that will change your whole thought process," Ferren said. "It doesn't mean you are going to know exactly what the future is, but having a sense that in 250 years you would like to address these things at least gives you an intellectual template and road map to test your ideas against." Bran Ferren spoke about the importance of using geodesign to collaborate and plan ahead. This process will be collaborative, too, according to Ferren. "That's the power of geodesign," he said. "It's this network extension of shared intelligence where the insights of individuals can be shared among others and can be used as the foundation to build upon." Ferren also said that geodesigners in the future will be entrusted with the same power over life and death that doctors have today because the decisions they make will be critical to humans and other species. "The mistakes you make in planning and designing our cities may take 100 years until someone understands the consequences of those actions. The Hippocratic Oath for geodesign: First, do no harm," he said. "Understand what you are doing and the effect—if you know this is going to do long-term damage, it is not okay to do it. We aren't on this earth very long. It's a mere blip. Try to leave it a little better than how we found it." 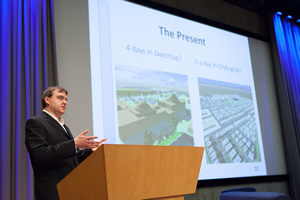 Ferren's talk, the featured presentations, and the technology demonstrations inspired many Geodesign Summit attendees such as Juan C. Perez, director of transportation and land management for the Transportation and Land Management Agency for the County of Riverside, California. The Geodesign Summit offered hands-on workshops where participants could work with technology. "The session that focused on the visual modeling and analytic tools when presenting land-use decisions to policy makers was excellent," Perez said, adding that he would like Riverside County to use some of those tools. Perez also said Ferren's proposal of a 250-year plan was thought provoking. "While perhaps extreme at first blush, it really puts into perspective that the land-use decisions that we make have very long-term consequences." Patricia Romo, deputy director of the County of Riverside Transportation Department, left the summit with several ideas on how geospatial technology could improve how her department communicates road construction and closure information to the public. While major road construction projects are listed on this site with images and some maps, Romo said she would like a site that organizes information on a map. "What I would like is to be able to go to a map and see the projects shown and then be able to click on it to see the type of project, the schedule, the cost, [and] a link to the project's web page," Romo said. "We also list road closures, but it would be nice to have a map to show these as well." The next Geodesign Summit in the United States is tentatively scheduled for January 29–30, 2014. Visit geodesignsummit.com to keep up-to-date with the latest information about that event. More organized events that focus on geodesign are planned worldwide, including the Geodesign Summit Europe, September 19–20, 2013, at the GeoFort in Herwijnen, the Netherlands, and the Geodesign International Conference, October 28–29, 2013, in Beijing, China. Shannon McElvaney, global industry manager for community development at Esri, contributed to this report.